Lucy: I'll never get used to your strange Cuban dishes. 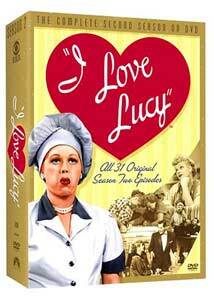 Back in 2002, Paramount began the highly anticipated DVD release of I Love Lucy's inaugural season. Fans couldn't wait to get their hands on their favorite madcap episodes, but wait they did. Instead of initially releasing all 36 first season shows in a sleek box set, the studio marketed nine (count 'em, nine!) individual volumes with a paltry four episodes on each disc. Sure, the remastered shows looked fabulous, and Paramount padded the DVDs with a smorgasbord of appetizing special features, but the sporadic release schedule maddened fans. More than a year transpired before the final disc hit the streets�at which time Paramount twisted the knife by at last releasing a complete Season One box set after all! Talk about a fiasco! Happily, Paramount has learned from its mistakes, and the sophomore season of I Love Lucy arrives in a handsome five-disc box set featuring all 31 episodes and a hefty package of extras. Like any sitcom, I Love Lucy often struggles to maintain its standards week after week, with episode quality and humor levels varying over the course of a long season. Yet the success ratio of Lucy and her gang remains remarkably high, and more than 50 years after they originally aired, the episodes continue to provoke laughter and an ever-growing appreciation for the brilliant talents involved. Such classic episodes as Lucy Does A TV Commercial and The Freezer made Season One a tough act to follow. I mean, after Vitameatavegamin, what do you do for an encore? Well, if you're Lucille Ball's writers, you merely come up with one of the most classic comedic routines in television history for the second season premiere. The episode's title, Job Switching, may not ring a bell right away, but if you picture Lucy, Ethel, and an ever-quickening conveyor belt carrying bite-sized chocolates, it's impossible not to recall the sketch. Lucy and Ethel find themselves in such a predicament when they bet Ricky and Fred that women can just as easily bring home the bacon as men�and that men can't perform the simplest domestic tasks. The couples agree to switch jobs for a week, and after meeting with a nonplussed employment specialist, the girls choose to work in a chocolate factory. Lucy's first task of rolling out candies ends in a gooey food fight with a fellow employee, which prompts her dictatorial supervisor to pair her with Ethel on the chocolate-wrapping assembly line. Meanwhile, Ricky and Fred find ironing and cooking far more arduous than they ever dreamed, and an overflowing rice pot provides fodder for plenty of laughs. A major portion of the second season was devoted to the memorable story arc of Lucy's pregnancy, which culminated in the frenetic childbirth episode. In Lucy Is Enceinte (euphemism for "pregnant"), a variety of circumstances foil Lucy's attempts to tell Ricky she's expecting, until she resorts to a very public plan. When Ricky finally learns Lucy's secret, we're treated to one of the series' most touching moments. More in the traditional slapstick vein, Lucy Goes to the Hospital is no less successful, and would stand as the highest rated show in TV history for many years. The impending birth of Baby Ricardo makes Ricky so anxious, Lucy and friends try to soothe his frazzled nerves by calmly rehearsing their departure for the hospital down to the smallest detail. Who can forget the bedlam that ensues when Lucy experiences her first honest-to-goodness labor pangs, which send Ethel, Ricky, and Fred into such a panic, they almost leave for the maternity ward without her! Other memorable episodes in the set include The Handcuffs, in which Lucy and Ricky discover the hard way that a pair of "trick" handcuffs is really the genuine article; and Lucy Hires A Maid, which finds our redheaded heroine cowering in the face of her bossy household employee, and resorting to typically drastic measures to get rid of her. The second season also sets up the major story arc for Season Three, in which the Ricardos and Mertzes drive out to Hollywood, so that Ricky can star in a film adaptation of Don Juan. Although many of the situations in I Love Lucy seem dated, most contain a kernel of truth that's still relevant. International wars may end, but the battle of the sexes rages forever, which gives the show's humor added punch. It's hard to believe, but the comic routines provoke the same hearty laughs today as they most certainly did half a century ago. The repartee remains swift and clever, and the cast's impeccable timing never ceases to amaze or impress. No sophomore slump here. The second season of I Love Lucy is as bright and fresh as the first. And having the complete, uncut episodes at our fingertips in a neat, tidy package makes us doubly appreciate the creative genius that often defines this iconic TV sitcom. Image Transfer Review: Paramount has done another stellar job in remastering this classic TV series for DVD. While some sections sport a slightly soft look, the bulk of the set remains crisp and bright, with sharp lines, beautiful contrast, and a nicely varied gray scale. The transfer's most bothersome glitch is intermittent shimmering, which often afflicts complicated clothing patterns, but the annoyance is thankfully minor and never detracts from enjoyment. Almost no surface defects mar the image, resulting in a smooth, vibrant viewing experience. Without question, these episodes look better than ever. Audio Transfer Review: The mono track sounds clear and distortion-free, and any age-related defects have been erased. The all-important dialogue is always easy to understand, and Arnaz's musical numbers (as well as the opening theme) possess a surprising fullness of tone. A slight tinny quality pervades many of the episodes, but that's due more to the actors' shrill exchanges than any sonic imperfections. A Spanish language track (recorded decades ago when the series was first sold internationally) is included for most, but not all, of the episodes. Extras Review: Paramount duplicates many of the attractive special features from Season One, including extensive bios of guest cast members (an invaluable reference), plenty of amusing flubs, the series' original animated openings (the satin heart was only introduced when the series went into syndication), and episodes of Lucy's popular radio show, My Favorite Husband, which inspired I Love Lucy. Extensive production notes also relate lots of trivia, and added insight is provided by readings from Laughs, Luck�and Lucy, producer and head writer Jess Oppenheimer's memoir, read by Larry Dobkin. New to this set, and of particular interest, are several special sequences that haven't been seen since they originally aired back in 1952-53. Due to Lucy's real-life pregnancy and the birth of Desi Arnaz, Jr., CBS was forced to repeat several episodes from Season One to give Lucy some maternity leave. The show's writers specially crafted an array of introductory scenes to add fresh elements to these reruns, and seamlessly transform them into "flashbacks." The footage remains in remarkably good condition, and it's a treat for diehard Lucy fans to see "new" material. Other rarities include a promo for Season Two that aired three weeks before the premier episode, lost animation that segued into the final commercial break of each show, a bit of deleted dialogue, and an end-of-season farewell from Lucy and Desi. Paramount gets it right this time, releasing Season Two all at once in an attractive box set. Beautifully restored and remastered, these classic episodes never cease to entertain, and make us remember over and over why Lucille Ball remains America's premier comedienne. Terrific extras enhance this five-disc celebration�a must-have for anyone who loves to laugh.